I'm finally starting to feel normal again so hopefully I'll be back to my normal blogging self soon! Especially since it's my birthday this weekend (eek, where did the time go?!?) and no one wants to be feeling crappy on their birthday! You may have seen me rocking this romper on a few of my Instagram pictures last week so I thought I'd finally share it on my blog since I really do love the mixed prints and colors in it. Not to mention I always get a ton of comments every time I wear it! Surprisingly I found this romper at Target last November (yeah I know, not exactly what you'd think of finding in any store in November but this is Florida...) when I was looking for something cute to wear on my company cruise to the Bahamas. I've been pretty adamant about not getting gladiator sandals because I've always felt like they can do some really weird things to your feet/legs/ankles. I knew that finding the perfect pair for me wasn't going to be easy so ordering them online wasn't an option. I found these randomly and decided to give them a try and what do you know... I didn't hate them! They're actually a lot more comfortable than I thought they'd be and I don't think they look too silly on me... hopefully... LOL! I definitely think with gladiator sandals (and a lot of other trends) you really have to try on several things before you find what works for you. i've been obsessed with rompers. love this one! This is really cute! Wish I could pull this off! I think rompers are the best creation EVER! I'm not typically a fan of gladiator sandals but you are rocking them with that dress! Love the that lip balm color on you! It goes great with the romper too. you should add this post to our linkup! it's perfect for #trending tuesday and you look gorg! Gorgeous! Another outfit I've seen I wish I had for Mexico next week! You're so lucky that you can wear rompers - I've tried on a couple, and I simply look ridiculous. I blame my thighs. :) Hope you're feeling better! Too cute!! Love the print! I thought it was a dress when you first posted the picture! Love it! Totally perfect romper, and loving that it's a target purchase! The top strap detailing is seriously the coolest. That romper is precious! I love the neckline! Loving this romper!! you look adorable in it!! Sometimes gladiators just go perfectly with an outfit and I am loving this combo! You look gorgeous in that romper! Yay for June birthdays!! Glad you are feeling better just in time to celebrate :) Loving your shoes! I absolutely love your romper! So chic! I'm stopping by from the #TrendingTuesday Link Up! Oh my gosh, that romper is so cute! The cut just looks amazing on you! Yay for coral! Such a great color. Glad you're feeling better (told you retail therapy would help ha). you know i love that pseudo dress :) bc i dont wanna call it a romper haha. so cutie cute! you can pull off those shoes bc you're a toothpick so congrats on pulling the trigger on them! I'm so sorry I missed saying Happy Birthday to you this weekend!!! I was running around like a crazy person. Did you have a fabulous weekend being spoiled appropriately?? I remember that romper at Target and I love it! Happy birthday!! 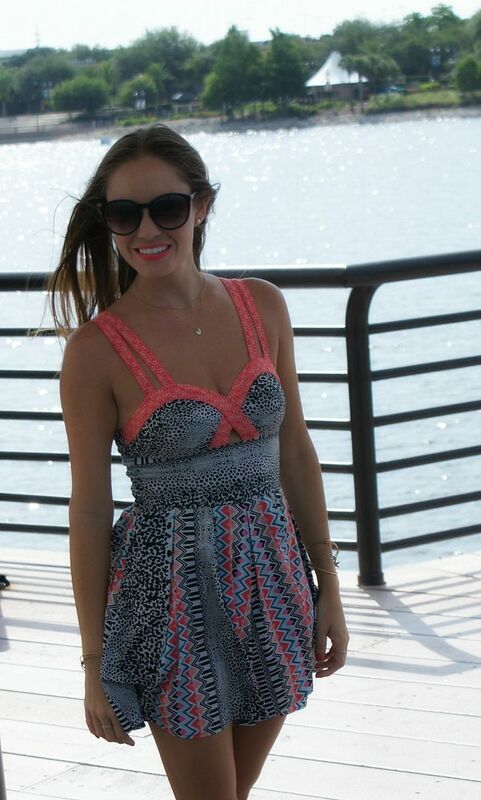 Love that romper on you, looks so cute! As always!!! I love a good romper- this one is fab on you! GORGEOUS! I know I already told you on IG-but I am totally obsessed with this romper :) Happy Birthday Week!! I love that romper! It look so good on your and perfect for the summer heat here in FL! Loving the romper Pamela! Its got such a cute neckline and those shoes are just perfect with it! so cute, i like the pops of pink! LOVE the double straps on this romper! You look darling in it! I love this romper. how cute! Super cute! I love rompers! I love the colors in that romper and the cut-out... so cute! I am obsessed with rompers! Love this one! Such great colors. And i love the cut out! Fabulous! So cute! Love the brightly coloured trim. this is so freaking cute! love the colour of the straps. so pretty!